T-Mobile's new 4G mobile broadband laptop stick, the T-Mobile Jet 2.0, can now be ordered for free (after a $49.99 instant discount and $50 mail-in rebate card), with a 2-year contract for mobile broadband service. 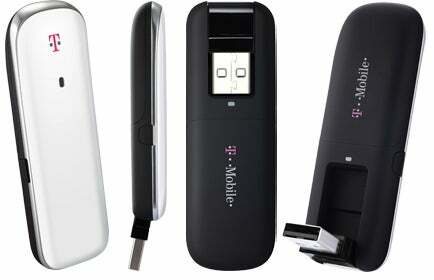 The device, which plugs into a USB port on your PC or Mac laptop, delivers high-speed HSPA+ 4G Internet access. With the news of AT&T's planned acquisition of T-Mobile, you might be wondering if buying a new T-Mobile product and signing a 2-year contract is a good idea. As PC World writer Tony Bradley previously pointed out, the acquisition is no cause for panic-it's likely more than a year away, and that's only if it goes over antitrust and other regulatory hurdles. Most importantly, T-Mobile has continued to demonstrate its commitment to growing its 4G network, with the announcement Tuesday of doubling the network's theoretical download speed to 42 Mbps and the introduction of new 4G smartphones, the T-Mobile G2x and Sidekick 4G. In addition to the Jet 2.0 laptop stick, T-Mobile is also launching other 4G mobile broadband devices later this spring: the T-Mobile Rocket 3.0 (first device with 42 Mbps capability) and a prepaid T-Mobile Rocket 4G. The T-Mobile Jet 2.0 is available now. It features Wi-Fi connection management and a microSD memory card slot so you can use the laptop stick for external storage as well as wireless Internet access (speeds up to 21Mbps). At the time of this writing, the Jet 2.0 was not listed under T-Mobile's Internet Devices category, but you can find it via search and add it to your cart from the product page. Monthly data plans start at $29.99 per month for 200MB.